Many drivers in West Palm Beach are making it too easy for thieves to steal their cars. ABC News WPBF reported that the West Palm Beach area is the fourth in the nation for most cars stolen with the keys or fob left in it. This information comes from the National Insurance Crime Bureau. They recommended that drivers lock their doors and not to leave their keys in the car. While this advice may seem rather obvious, it can be easy to forget. However, whether the keys are left in the car or not, taking someone’s vehicle without their permission is illegal. If you are charged with stealing a car, you should contact a knowledgeable robbery and burglary attorney as soon as possible. Florida does not have a specific statute that addresses car theft. 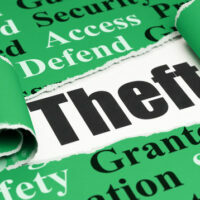 Instead, motor vehicle theft is included in the general theft and robbery statute. Under the statute, theft of a motor vehicle is usually a third degree felony and is punishable by a fine of up to $5,000 and/or a sentence of up to five years in prison. People convicted of stealing a motor vehicle may also see their driver’s license suspended for up to six months. In order to be found guilty under this statute, the prosecutor must prove that the defendant knowingly used or took someone else’s car without permission. This means that even taking someone’s car and returning it, or “joyriding”, can be prosecuted under this statute. It is also illegal for someone to use trickery or fraud to get the use of a motor vehicle. For example, lying to someone to get their keys by telling them you are going to get something out of their car and then using the keys to drive the car away is also a felony. It is also against the law to take or use a motor vehicle beyond any permission you may have. This includes keeping a rental car beyond the time that the car has been rented for. While most motor vehicle theft is a third degree felony, there are some circumstances where stealing a car is a second degree felony. This includes stealing a law enforcement or emergency services motor vehicle or stealing a car that is worth at least $20,000 but not more than $100,000. Second degree felonies are punished by up to 15 years in prison and/or a fine of up to $10,000. Stealing a car valued over $100,000 and carjacking are both first degree felonies. These can be punished by up to 30 years in prison and/or a $10,000 fine. Stealing a car in Florida is a serious crime and it comes with harsh penalties. If you are charged or accused of stealing a motor vehicle, you should contact a knowledgeable robbery and burglary attorney as soon as possible to help with your defense. Our experienced robbery and burglary attorneys at The Skier Law Firm, PA in West Palm Beach, Florida, will zealously defend you against the charges.